Mt Olympus; brave hiker takes his bath in the beautyful cold waters of Enippeas Gorge. 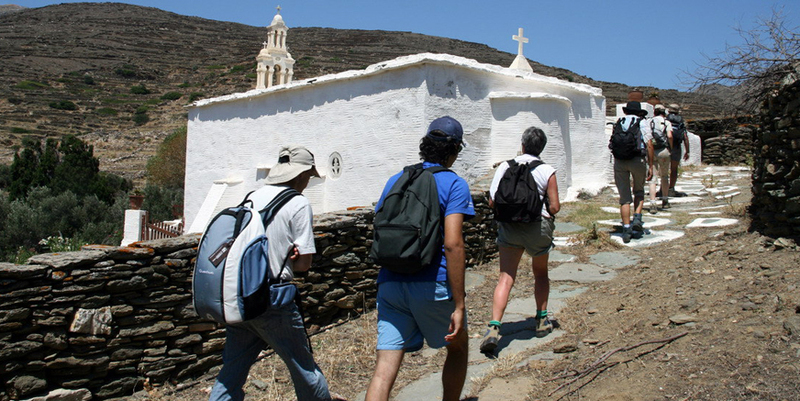 Hiking on Tinos near Xobourgo; it's more exiting that you can imagine! 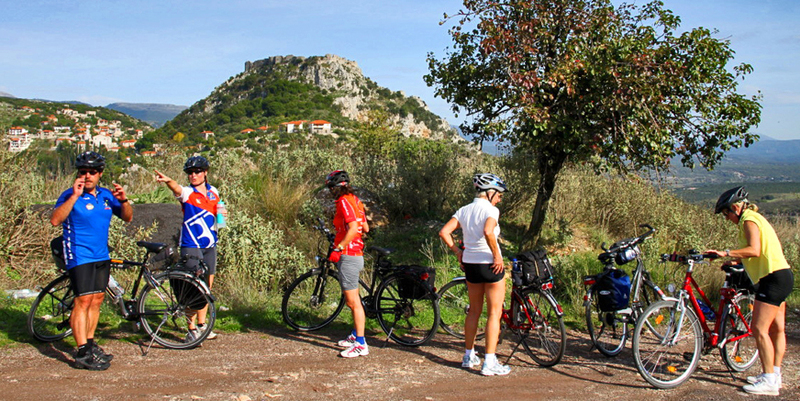 Arcadia; bikers near the medieval castell of Karitena. 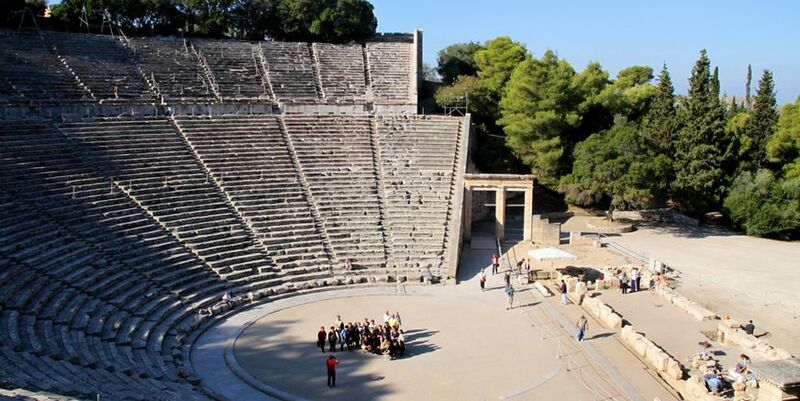 The Theater of the sanctuary of Asklepios at Epidaurus is a miracle of beauty with exceptional acoustics. 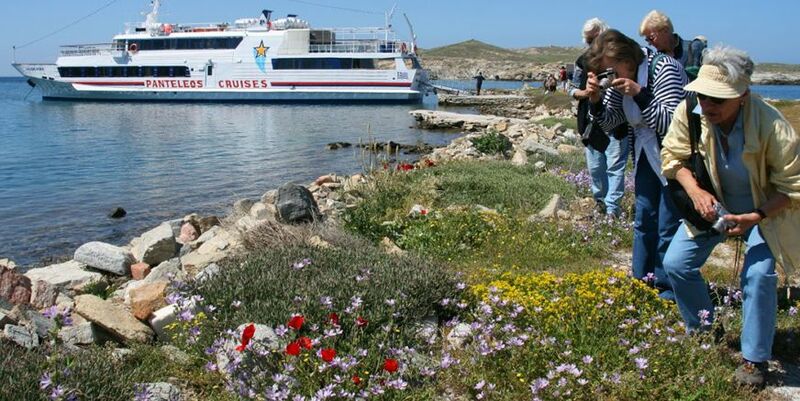 Photographers taking pictures of spring flowers on Delos. 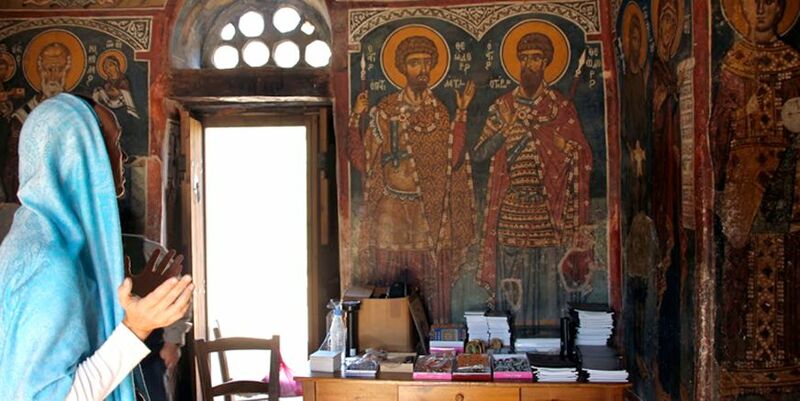 Cyprus; praying in the byzantine church of Panagia Forviotissa in Asinou. Central Greece; trekking in the Western Agrafa Mountains. 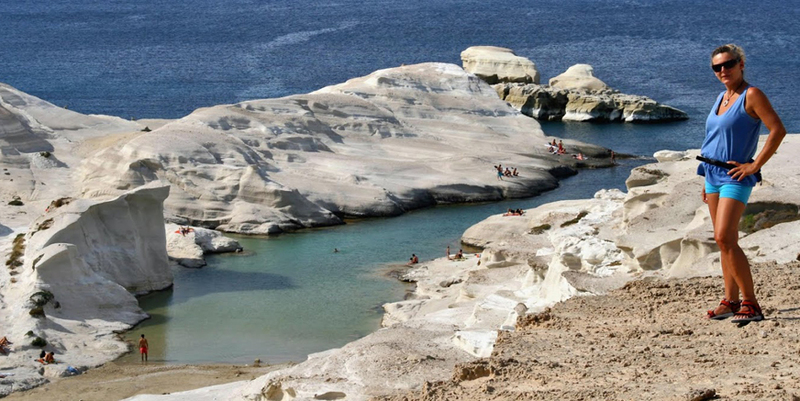 Aphrodite apearing near the impressive rocks of Sarakiniko on the volcanic Island of Milos. Hikers on Saria Island waiting for the boat to return to Diafani. 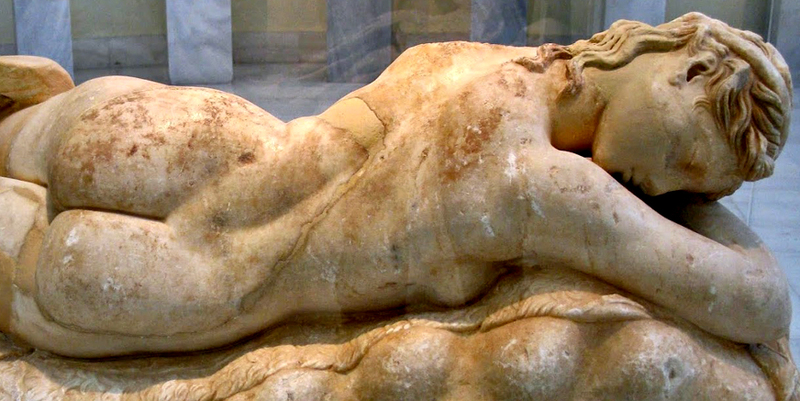 Maenad sleeping in the Archaeological Museum of Athens. 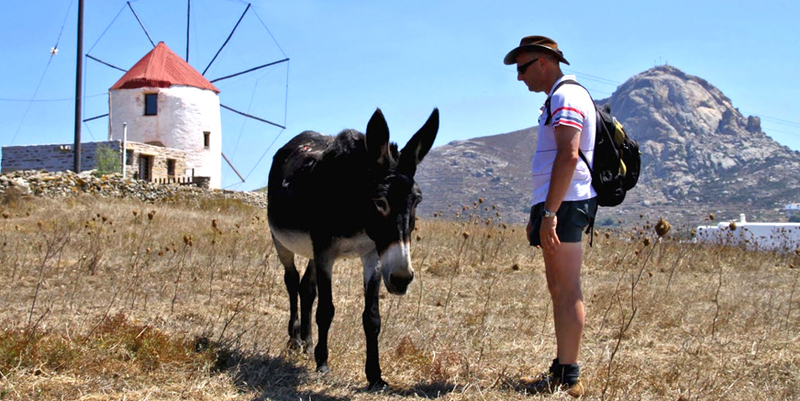 Hiking on Tinos at summer time. 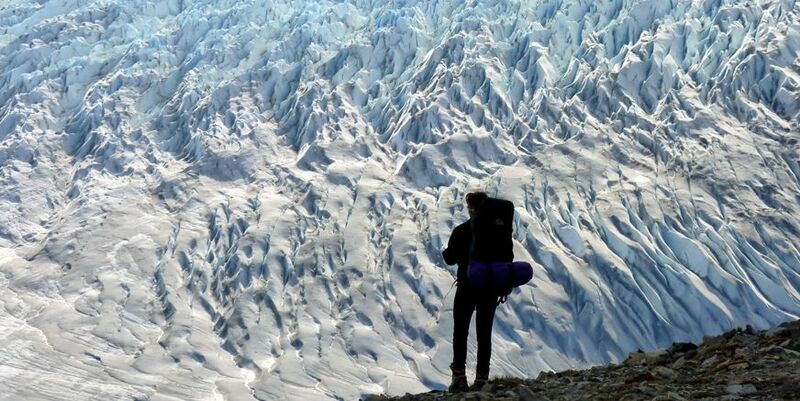 Brave trekker in Chilean Patagonia hiking towards the Grey Glacier. 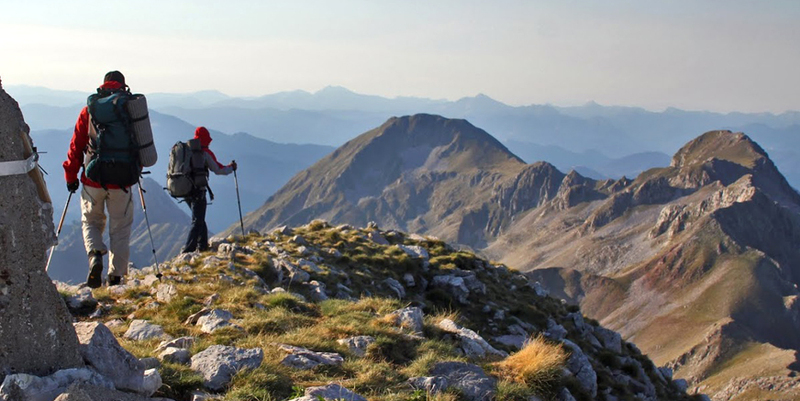 8-day hiking tour in southwest Crete. The south-west coast of Crete has become a favorite destination for hikers from all over the world because of the unique beauty of the landscape and its often exotic character, the close combination of mountain and sea, the maintenance and marking of paths and the existence of the necessary infrastructure. 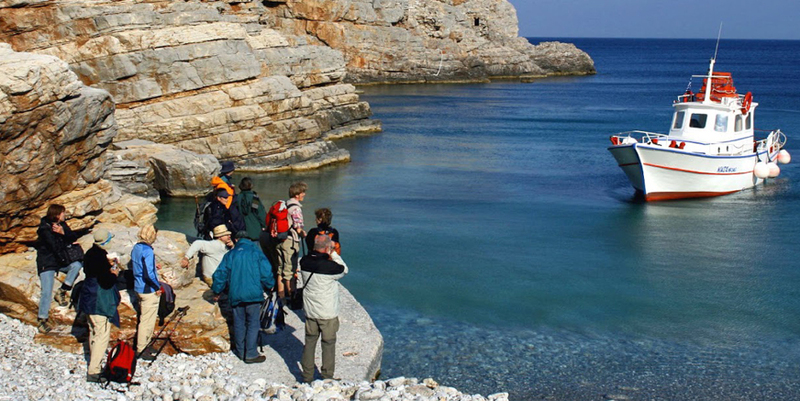 You walk mostly along the coast of the Libyan Sea, three times you hike to the island's interior to return back to the sea crossing the gorges of Agia Irini, Samaria and Aradena. An early morning departure is highly recommended, especially during warm periods. Frequent bathing opportunities. Depending on the time of arrival or departure, you can visit the cities of Chania or / and Heraklion. An 8-day educational and hiking tour. The sickle-shaped island lies near the continental coast of Epirus, from which it is separated by the Sea of Corfu. Wide and mountainous is its northern part, narrow and hilly the southern. Olive trees and cypresses characterize the landscape. Spared by the earthquakes that destroyed the other Ionian Islands, Corfu conserves its beautiful old villages and the mediaeval town. Endless nature offers the ideal conditions for many hikes. A European city with six thousand years of history The second half of the 5th century BC is the high classical period of ancient Greek culture. After their victories in Marathon, Salamis and Plataea against the Persians, the Hellenes keep participating at the Olympic Games, where the winner was crowned with a simple olive wreath, and traveling to the Oracle of Delphi, to ask Apollo about the future. In Athens, the intellectual and cultural center of Hellas, democracy blooms. Pericles, the most prominent statesman of the city, orders the construction of the Parthenon and the other monuments of the Acropolis. Phidias adorns these temples with his sculptures. The great Tragedians of classical Greece take the old myths as an occasion to deal with existential questions, and their tragedies are performed during the dramatic competitions in honor of the wine God Dionysus. Hippocrates elevates the ancient healing practices to scientific medicine. The Sophists declare man is the “measure of all things” and Socrates asks him to recognize himself. In such an environment lives Plato in his youth. The foundations of Western civilization are laid. Romans, Christians and Turks came later. The classical past was ousted, and Athens sank into insignificance. When Modern Greece was established, the young prince Otto of Bavaria was elected king, and Athens was chosen as its capital. At the end of the same century, the first modern Olympic Games took place here. After a difficult 20th century (Balkan Wars, World War I, Asia Minor Catastrophe, World War II, Civil War, Dictatorship), Athens is today a big modern city; with a new face, and it successfully organized the Olympic Games of 2004. Despite recent economic crisis, the great city remains a must-do for every traveler interested in classical culture. It is really beautiful to walk along the cobblestone promenade beneath the Acropolis, then watch from the Philopappos Hill the Parthenon in the last daylight; or take the tram till the coast of the Saronic Gulf to enjoy sunset from the waterfront promenade. We guide you to the cradle of "western" civilization in any possible way, offering you good company, unspoiled nature, art, history, poetry, philosophy and physical activity. Surf our web site and find the trip that suits you or contact us in order to plan together a brand new journey.